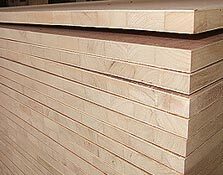 Our wide array of block board is built out of selected seasoned timber, which is subjected to machining on our new modern wood working machines. Our Wooden Block Board offers unsurpassed strength, rigidity and stability. The board is created with cross bands of core veneer and face veneer bonded with phenol formaldehyde synthetic resin in hot press process with high pressure & temperature to make it 100% boiling water proof. The standard thickness is usually 19 & 25 mm. Our exhaustive range of Wooden Block Boards is termite resistant, warp free and durable, and can withstand any kind of climatic conditions.